There are spas you visit and think “Erm… its alright” and there are spas you visit and think “I want to come back and I’m going to tell everyone about it!” Poise Organic and Wellness Spa is of the latter category. A bit of a hidden gem, I would never have unearthed it had Connie and Gillian of Poise not contacted me to stop by their relatively new spa and take a look. Poise Organic and Wellness Studio is located in a semi-detached 3 storey house in the Old Klang Road area of Kuala Lumpur. Its essentially a housing area just behind the Pearl Point Shopping Centre. I’ve got a map below to show you just where it is. Parking can be a bit of a problem if there are many customers, as the compound isn’t very large. From the outside, it looks just like another well renovated house. Stepping into the waiting area is like stepping into your best friend’s living room. The staff are friendly and you are made to feel welcome with tea, while you choose your massage oils and body scrubs (all of organic origin). I was having a “Your Choice Getaway” – 155 minutes of a body scrub, body wrap, massage and relaxation break. Sounds absolutely decadent! 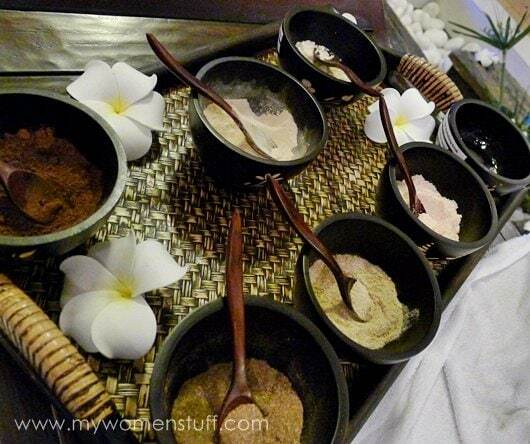 Once you choose your oils and scrubs, you are led upstairs to the treatment area. This is right on the third floor, and I was informed that the wet area where the body scrub and wrap is to be, is separate from the dry rooms where the massages are performed. The rooms are all couple rooms with two beds so you can go with a friend, but if you are just one person, they of course won’t make you share. An interesting point to note about Poise is that they cater primarily for women. I must say that it is a nice place to meet up with a bunch of girlfriends and just hang out while you relax because its got a lovely ambiance. They do not admit men as a matter of course, unless accompanied by their female guests so those who’d like to bring their significant other may do so, but otherwise, no men are admitted. Your belongings can be kept in a locker in the yoga room (yes there are yoga lessons there too) with the key kept with you at all times. From there, you are led to the wet treatment area which is, interestingly, an open-air concept. Not 100% open air (it’d be too hot or hazardous if it rains) but its open and a very interesting concept. 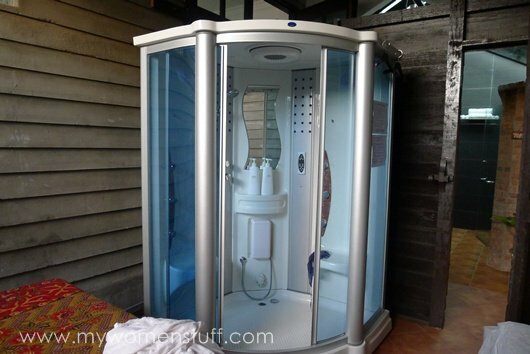 You start off with 20 minutes to yourself – 10 minutes in the steam room and 10 minutes in the jacuzzi. There are 2 treatment beds and 2 jacuzzi so 2 people can have their treatments at one go. If more people wanted to have the spa treatment I don’t know if they can accommodate or if you’d have to wait your turn. Once your 20 minutes is up, the therapist comes back into the room for the body scrub and body wrap. I chose the coconut scrub and wrap for something different. And I found the body scrub a little different from what I’m used to too. The therapist really scrubbed every square inch of my body. As in scrubbed. It wasn’t painful and in fact, it felt like I was already having my massage. After that, some warm coconut solution was applied over my body, and I was wrapped up like a packet of nasi lemak and left to marinade for about 15-20 minutes. It was a warm evening at that point, and I’m quite sure I dozed off. Once you’re done and wrapped up in your bath robe, you are led downstairs to the treatment room. As I’m in a predominantly women only place, I’m less fussed about this. 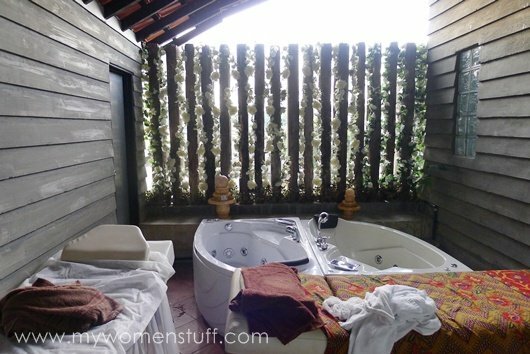 I do however, prefer that wet works be located closer to the massage rooms to minimize exposure when you aren’t quite looking your best or clad in much other than a robe. The rooms are air-conditioned but aren’t too cold so its all quite comfortable. Although the body scrub and wrap was nice, what I must really commend Poise for, is their body massage. The lady I had was amazing. Her fingers sought out every knot in my stiff back, neck and shoulders and massaged them away to leave me feeling light as air. I was dozing for most of the massage which really says a lot. It was that relaxing. Granted, you might not take my word for it, so to test the service and quality of the massage, I sent my friend along the following week to give the massage a go. The feedback that came back to me was pretty much what I just told you here. An excellent massage that left us feeling so relaxed. For those of us who work in offices and are hunched up over our computers all the time, you’d probably know the sort of tight feeling I mean, around the back of your neck and shoulders. The massage I had here was one of the few that managed to catch every knotted muscle and knead them out again. I’d go back just for the massage. Cons: Traffic getting into and out of the Old Klang Road area can be awful, Parking spaces are limited, Wet treatments might be limited due to limited space and you have to exit the wet area to get to the dry rooms. So, how much will 2 hours and 35 minutes of indulgence set you back? RM159. Even I was surprised. I expected it to cost more so of course I was happy. In fact, a 90 minute body massage costs just RM90 which I think is a perfectly reasonable amount to pay for a good massage and the 5 star service you get. Its going to be hard to pay more at other places now. I was told after that, that Poise does offer a special rate for first time customers. 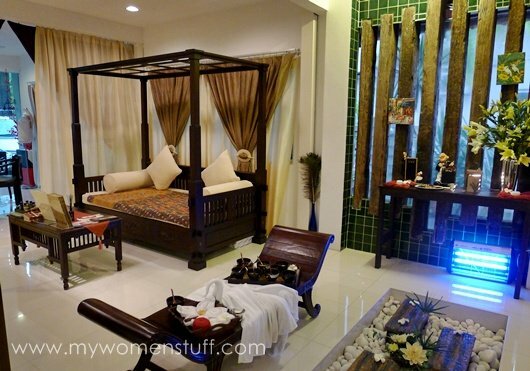 A 90 minute massage is just RM60 (friend confirmed this when going for the massage) and my friend also told me they bought a spa package just like the one I had, at about RM275 for 2 sessions which you can use for yourself or use with a friend. That’s such an amazing deal! I didn’t know about the spa package deal but do ask if you might be interested. I’m booking my sis and Mom for a session the next time they’re in town 🙂 Reservations are advised. Poise has just won an award for Best Day Spa Design at the Malaysia Spa & Wellness Awards 2011 so bookings might be picking up. Poise Organic and Wellness Studio is at 205, Jalan Sepadu, Taman United, Off Jalan Klang Lama, 58200, Kuala Lumpur. Tel +603.7980.8890 Opening Hours: 9am-8pm. or find them on Facebook. Disclosure: Featured service was provided complimentary for consideration. All subsequent services were paid for by us. For posting guidelines please read my disclaimer. ooh i have yet to visit this. guess gotta wait till after my vacation 😉 i wanna be left to marinate too 😀 smooth and silky! Yes yes! Let’s have a girls day out after we both come back 😉 I want to be marinated again! Ahhh looks so relaxing, that is definitely calling my name!!!! Happy Weekend PB! Perfect! I will drag my mum and sis there next Friday. Latter is going to need it since she will be babysitting 200+ screaming kids at the Justin Bieber concert on Thursday night. This is interesting. Will definitely visit it the next time I am back in Malaysia. Am reporting after my visit yesterday. 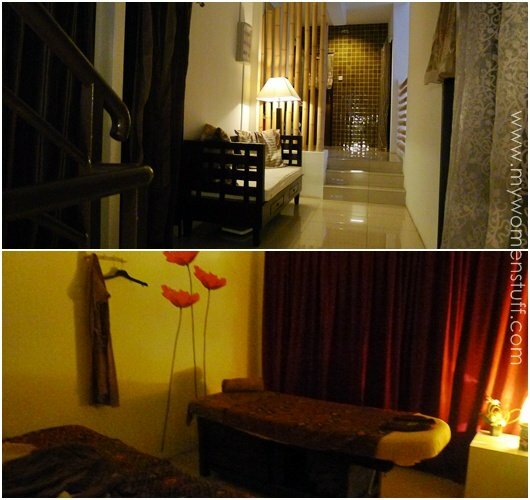 I took the Spa package which includes the scrub, body mask and massage for 2h30m duration. The scrub on me felt more like applying butter on me than real scrubbing, comparing with my past Spa experiences in other places. Then they applied a wrong mask on me (not the one I chose, I chose ginger but was given chocolate), so I was wrapped in cocoa. But I must say that the massage was good. The therapist did a good job in identifying my tight muscles and concentrating more on those parts. I was told by Julian (one of the lady boss) that the Therapists are from Sabah and Indonesia, some of them are specialised on Tradition Malay Urut. Please do not go to Poise Organic Wellness Studio; the staff are thieves and management does not care about the customers that have been stolen from! Poise staff from the Ampang Hilir branch stole a neckless, pearl and diamond pendant from my wife who was just released from hospital and defenceless. The necklace and pendants were placed on a table far from the bed. It is sure the Poise staff, masseuse Holly and a female driver, stole the items, because they returned the necklace and pearl immediately after we found out and confronted them on the telephone. The Poise masseuse and driver alleged that the jewels were accidentally rolled op in the bed sheets and that they found them in the car. They have however refused to return the diamond pendant. Police investigations are on the way. Sorry to hear that happened to you. However, from my understanding, Poise had filed a police report to investigate the truth and yet to have find any wrong doings from Poise. They even showed me a proof of the police report they made as I confronted them pertaining to this matter. I’ve been to Poise since they started and always have good feedbacks and good review from other customers too.